Have you heard Viet Cong covering Dark Entries? Wow! Have you heard Viet Cong yet? The LP is excellent – heavy, dense and distorted and more than a bit post-punk. Part of the excellent Pitchfork review is below and after only a few listens it is becoming a firm Gods and Alcoves favourite. …A year later, Viet Cong are a cohesive and confident unit that goes even further into inaccessibility than Women, confrontational in a way that reaches out to an audience rather than turning inward. The sound that begins Viet Cong most closely resembles someone trying to punch their way out of a coffin. The record ends with an 11-minute song called “Death”. It is also a self-titled debut from a band named Viet Cong. So whether you’re familiar with their past or you’re just here because you’ve been hearing things about this band, everyone is getting the same first impression: That of a very serious rock record that won’t offer too many cuddly points of self-disclosure. So, in the moments where Viet Cong do reveal themselves, you might want to pay attention. Two important instances occur during “March of Progress”, Viet Cong’s astonishing six-minute centerpiece. Matt Flegel could be mocking the speculative nature of music criticism and predictable, tiresome process of “proving” one’s self in dazed, layered harmony: “Your reputation is preceding you/ We’re all sufficiently impressed/ And this incessant march of progress/ Can guarantee our sure success.” It proves Viet Cong are self-aware, have a subzero sense of humor to match their environs, and recognize those two qualities might combine to give the impression that this isn’t music that is meant to be enjoyed. That’s when the double-time beat kicks in, and Viet Cong make a sprightly, major-key sprint towards a dead halt. There’s mastery of form, instrumental prowess, and on a record that thrives on unpredictability, “March of Progress” elicits the most unexpected response—that was fun. Viet Cong is full of knowing moments and reference points—the fact that it could pass for Guided by Voices (“Continental Shelf”), Wolf Parade (“Silhouettes”), and This Heat (take your pick) is enough of an accomplishment. It is not exactly a meta work, however. Viet Cong are just a band that’s unusually obsessed with the mechanics and process of their given trade. While their ashen sonics and rigid demeanor is liable to have them labeled as post-punk, they’re also industrial in a literal sense. Flegel’s vocals are those of a foreman, authoritative, commanding and prodding. Guitars often sound dissolved in caustic chemicals; instruments contort themselves and interlock to achieve forward momentum. It’s music that works very, very hard to express a perverse hometown pride you often see used to sell spring water or thermal outerwear —you might not want to brave Calgary’s bleak winters, but the way Viet Cong captures its forbidding chill and placid, sprawling beauty sure make it seem like a good place to be a post-punk band. 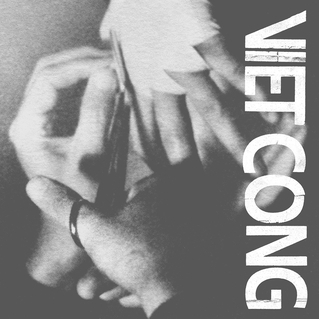 via Viet Cong: Viet Cong | Album Reviews | Pitchfork.